Aneesh emailed me asking how you can pass the entry for Intraday Trading for Stock Market in Tally. Though he had in total 3 questions and in this video I have covered only one of it. In the next video, I will cover another 2 of his questions. 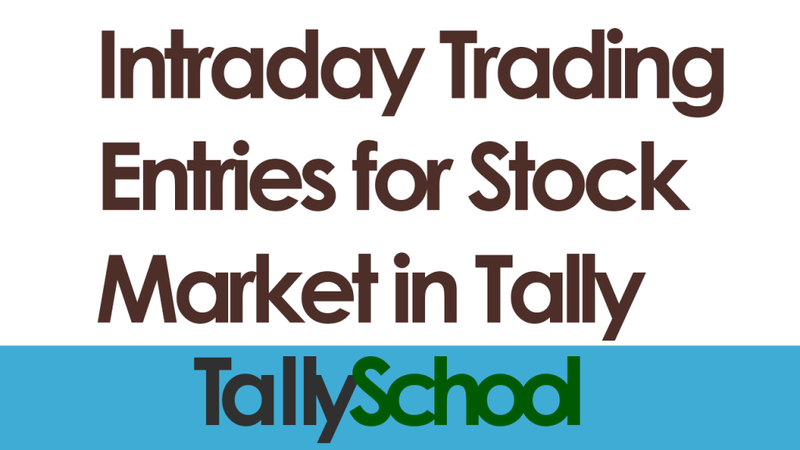 How to pass an intraday trading entry in Tally? Before I explain everything, let me tell you that intraday entry in Tally is very much easy than you think. Yes, it is by far the easiest entry that I have explained for all other stock market videos that I have created. Okay, without wasting yours and mine time, I present you the video of intraday trading. If you do not know what intraday trading is, then don’t be shy. I’ll explain you what intraday trading in a simple and easy way. Let’s say you bought 100 shares of Reliance at 10.00 AM and sold the same 100 shares for a profit of ₹100 at 02.00 PM. This is what is called intraday trading. You buy shares and sell the same shares on the same day. On the other hand, if you sell the shares which you do not have and buy those shares on the same day, that is called short selling in intraday trading. The word in itself clears the meaning. Intra means within and you and I both know the meaning of day. So it clearly means Within Day Trading or in simple words trading within the day. This was explanation for the basic intraday trading and what it is called. Now let’s see what is to be done for passing the entry. Intraday Profit and Loss Ledger can be created under Capital Account if you are an investor in stock market. On the other hand if you are a regular trader or speculator in stock market, you can create intraday profit and loss under Income or Expenses. Because at the end of the year you would not know whether you would have total intraday profit or intraday loss. You have to check out the position of intraday profit and loss account and if it is loss you can show it under Direct Expenses and if it is income you can show it under Direct Incomes. So, it does not matter whether you choose Income or Expense at the time of creating ledger. Just check the position in the Balance Sheet and alter the ledger at the end of the year. On the other hand when you are an investor, you do not have to worry about which group to choose. Because, you have to choose Capital Account. If you have profit, the ledger will show positive balance and else the ledger will show the negative balance. Positive balance means Profit and Negative balance means Loss. The technique behind this entry is very simple. In Intraday trading at the end of the day, you square up the positions. Now for those who do not know, squaring up means equaling the sales and purchase at the end of the day. For example, if you buy 100 shares and sell 100 shares, it is called squaring up and if you do the squaring up in the same day, it is called intraday squaring up. So, this technique which I am going to show you today is based on the the squaring up. At the end of the day, we do not hold any stocks and therefore there is no need to enter them in Tally because eventually there will be no stock in your balance. We will just pass the entry for the profit or loss and other charges such as brokerage, taxes and so on. This will save the time because instead of passing the entire entry, we are only passing a single entry for recording brokerage, charges and taxes. Passing the intraday trading entry is one of the simplest trading entries in Tally. Select Journal or simply press F7. The pass the following entry as shown in the picture below. And select the narration for the entry as per the details. I have written a narration for this entry as shown in the image below. After the narration is written, press Enter and save the entry and you are done. After you have passed the entry, we can easily check it in the Capital Account in the Balance Sheet. 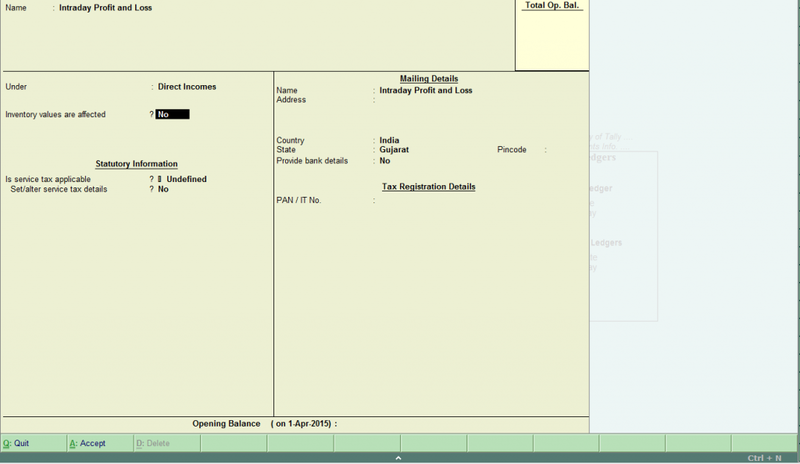 Here is the entry of ₹100 showing in the Capital Account in the Balance Sheet. This is a pure profit of ₹100 showing up in the capital account in Tally. If you are not an investor and a trader, there is just one simple thing you can change to write the accounts as trader in stock markets. Remember the Intraday Profit and Loss Account is under Capital Account? That is because we were passing the entry as an investor. If you are trader, simple change the Capital Account with Direct Expenses or Direct Incomes. 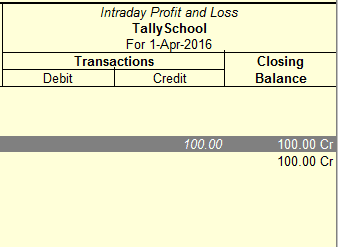 This way, Intraday Profit and Loss will start showing in the Profit and Loss Account instead of Balance Sheet. It is the real catch between trading and investing entries in Tally. Just change it and you will be a trader or an investor. I will be posting the next video which will be the continuing part of this next Monday. I have posted the video and post along with that. I have written many posts about share transactions in Tally. Thanks for your guidance and your videos helped me lot. I have a doubt regarding calculation of Intraday Turnover (Treated as Business Income). How intraday turnover will be reflected in Profit & Loss Account as Intraday Profit & Loss Ledger will show only the balance and not the total intraday turnover. If one day I earn 500 as Intraday Profit and on another day, 700 Rs. Intraday Loss. then total intraday turnover must be 1200 Rs. but Intraday Profit & Loss Ledger will only reflect 200 Rs. balance. Alternatively, I used the ledger Intraday Turnover under sales account. But this will not work at the time of Intraday Loss when turnover and broker both needs to be credited and loss will be debited but entry will not balance. You should make only one ledger named Intraday P/L (instead of Intraday turnover) and thus all the losses and profits will be there in that ledger. 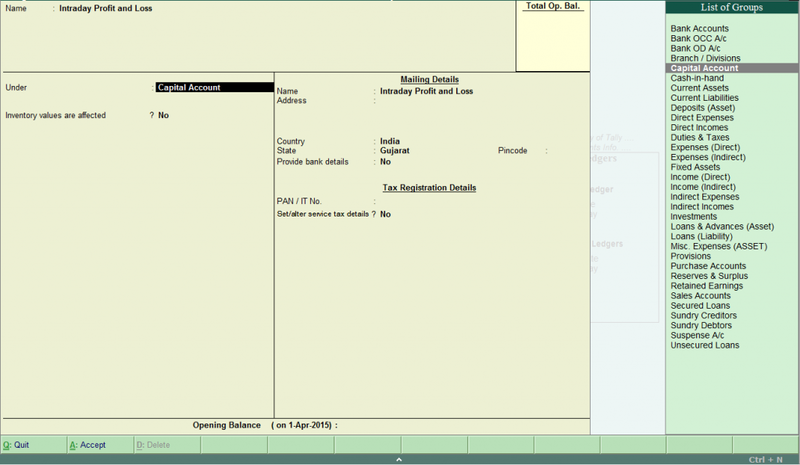 One ledger named Intraday P/L will not show total turnover which is mandatory for tax purpose because Turnover is required to calculate 8% Profit for Tax Audit Purpose. Turnover is total of difference between Sale and Purchase Values, be it a negative or positive figure. So Intraday P/L ledger will show only difference of profit or loss transaction and will not give figure of gross turnover. For that you can go in to the Intraday P/L ledger and see all the debit and credit entries and total it up. I know, it is possible manually but I want to do it in proper accounting procedure so that correct turnover may be shown in Profit & Loss Account. Your Site is just awesome .. and you are doing a great job please keep it up..
and did you get any solution for this , I am facing the same problem. I Have the same Query .Please help me Out. For that you can pass the entire entry with the sales and purchase details even in share intraday entry. Can you please explain how to create and adjust provision for Taxation entry against self assessment tax,TDS and Advance Tax. The entries for all the above are almost similar. But for learning Taxation in Tally, you need to buy the TallySchool DVD Course. You can group the shares under a different group. For example, you can create a group named Share Market and put the shares under that group.